Just steps from Glasgow’s Style Mile, the Lighthouse serves as a popular place to spend a couple of hours. Also known as Scotland’s Centre for Design and Architecture, this attraction is most famous for its sweeping views of the city’s eclectic skyline, best seen from its sixth-floor viewing point, accessible by elevator or by way of 133 steps up a spiral staircase. 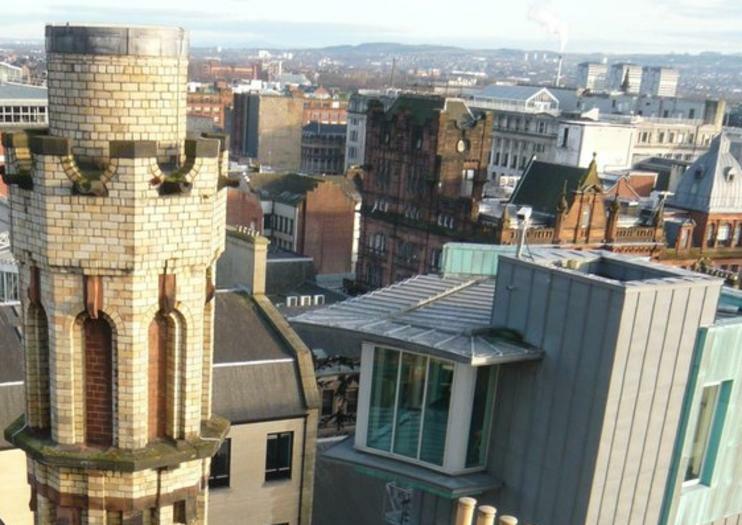 Designed in 1985 by iconic Scottish designer Charles Rennie Mackintosh, the Lighthouse was originally home to The Glasgow Herald newspaper, one of the longest-running newspapers in the world. But regardless of the newspaper’s history, why is there a lighthouse up an alley in central Glasgow? Well, the building’s famous tower only resembles a lighthouse—the tower was actually built to house an 8,000-gallon water tank to protect the building and its contents against fire. The Lighthouse hosts exhibitions, workshops and discussions related to design and architecture. The permanent Mackintosh Interpretation Centre, located on the third floor, allows visitors to see small-scale models of Mackintosh buildings that never came to fruition, along with original furniture and photos. As the Lighthouse was the designer’s first public commission, it is an ideal starting point for a Mackintosh-inspired trip through Glasgow. Tag på sightseeing i Glasgow med dobbeltdækkerbus med åben top på en Hop-On Hop-Off-sightseeingtur i byen. Oplev den livlige, kosmopolitiske by i dit eget tempo, og lyt til optagede kommentarer i løbet af ruten, der varer 110 minutter, og stig af ved mere end 20 strategisk placerede stop for at udforske Glasgow. Busbilletter er gyldige i 1 eller 2 kalenderdage i træk. Mød en lokal og mød byen, vores uforglemmelige byudforskningskoncept giver dig mulighed for at opleve den by, vi lever, og elsker trough personlige ture, opdag historien og alle de hemmelige steder i Glasgow ledet af en lokal beboer. Med denne udforskningsplan vil du møde den mest historiske side af Glasgow, alle byens ældste og mest vigtige vartegn, din lokale guide vil lære dig om byens historie og hemmeligheder, da det tager dig på denne udforskning gennem steder som Macintosh designet fyrtårn, den berømte Wellington statue, helt til St.Mungos Cathedral den ældste bygning i byen.